Two months ago my friend Todd Sternfeld, CEO of Superior Concrete Products, invited me to visit his Cleburne, TX plant to stage a mini-golf clinic for some of his employees. Before giving his staff some golf lessons he took me on a tour of his impressive facilities. While on my tour Sternfeld showed me his newest project called Concrete Tiny Houses. I came away marveling at how well-designed these homes were and how good they looked inside and out. Then last month, his company’s factory in Cleburne showcased the Cleburne Ranchette and the Chisholm Trail Cabin during an open house, so I brought along my wife, a realtor, to see the Tiny Houses. There was a good turnout of the people invited to see modern living in action during the preview of the company’s first two Superior Concrete Tiny Houses. I learned that Superior Concrete Products are the nation’s first superbly designed and crafted precast concrete tiny houses. 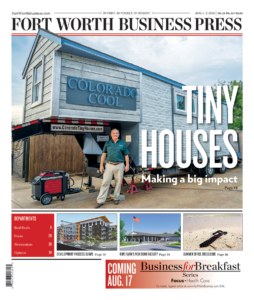 Todd Sternfeld spotted a housing trend that is sweeping the nation – tiny houses. People are living large on a smaller scale in increasing numbers, and Sternfeld’s expertise in the modular precast construction industry made the move into custom concrete tiny houses a smooth transition. 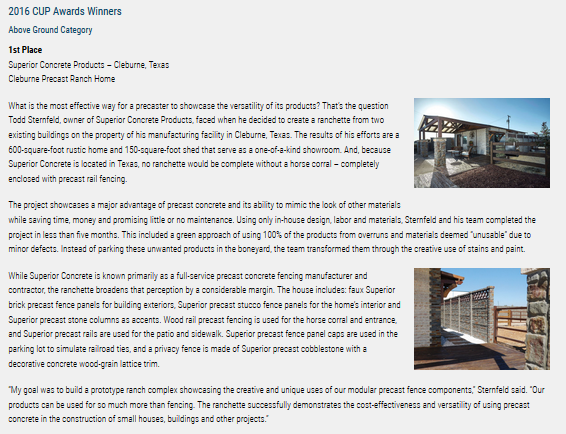 In fact, his first project, the Cleburne Ranchette, has been featured in numerous publications, and won a first place award for the creative use of precast concrete when his design was recognized by the National Precast Concrete Association in March 2016. A 600-square-foot modular precast custom tiny home, The Cleburne Ranchette is finished in a luxurious, but care-free rustic ranch style.